Shock headline: Right brain left brain theory has been debunked. The popular theory suggested that the two halves of a human brain had different functions. The right-brain was said to be good at music, colour, images, faces, emotions and creativity. The left-brain was said to be adept at language, logic, analysis, reasoning and numbers. So in my family we all thought that artists were right-brained people and accountants were left-brained. My wife, daughter, and myself are all professional artists. My sister, brother, and brother-in-law are all accountants. We glowered, in a friendly manner, across the right-brain left-brain divide and each felt superior in our differing ways. But apparently we were mistaken. Or were we? I think I have based much of my art career on the assumption that artists were understandably bad at maths, logic and business. I thought that if I could study and use some basic business skills maybe I could survive and succeed where myself and others should expect to fail. The ‘starving artist’ model was beatable by just finding out how to use my left-brain. Ah-ha! And it worked! I have indeed survived and succeeded as a full time artist for 50 years. Until now I thought that it had worked based on right-brain creativity plus the application of left-brain analysis and business strategy. But now I cannot be quite so sure. 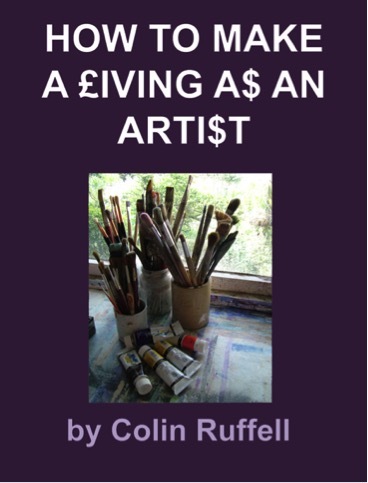 Furthermore, my book titled ‘How to Make a Living as an Artist’ published 10 years ago, and now out of print, might need extra revision before I republish it. The initial research in the 1960’s by the Nobel prize winner psychobiologist Roger W Sperry suggested that language and mathematical skills were based in the left hemisphere while artistic creative skills were in the right. Sperry based much of his findings after studying the effects of drastic accidents or surgery where the two brain hemispheres are separated. He saw that the two hemispheres responded differently to stimuli. But recent research at Utah University in America based on 1000 people, ages 7 to 29, has been published that shows the two hemispheres communicating and sharing many of the functions previously assumed to be specifically right or left. And concludes that as most of us have intact brains the split-brain findings are inappropriate. However, the human brain is certainly divided physically into two hemispheres. The right hemisphere controls muscles in the left hand side of the body, and left-brain controls right body muscles. Our left hemisphere process what we see in our right eye and vice versa. I don’t know why! But there is no doubt about it. And everybody knows that there are right-handed people and left-handed people. So the creative right-brain versus logical left-brain idea seems to make sense. The twin-brain idea was popular for about 50 years. We all went along with it. In fact we probably conditioned ourselves into behavioural choices because we believed it.